Royal Australian Navy Leading Seaman Medic Tahnee White has been awarded an American Joint Service Achievement Medal from the US Special Forces for her outstanding work in Afghanistan. Over a six-month deployment in Afghanistan, LS White has been deployed in a Role 2 hospital in Kabul, before being told she would be detached to an airbase nearby for over a month. Here, LS White supported the coalition Resolute Support mission in Afghanistan alongside US forces deployed to NATO Special Operations Component Command-Afghanistan. She held the medical non-commissioned officer-in-charge position for the Command Surgeon’s Office Clinic within the US medical facility, providing advice on medical issues affecting the command. 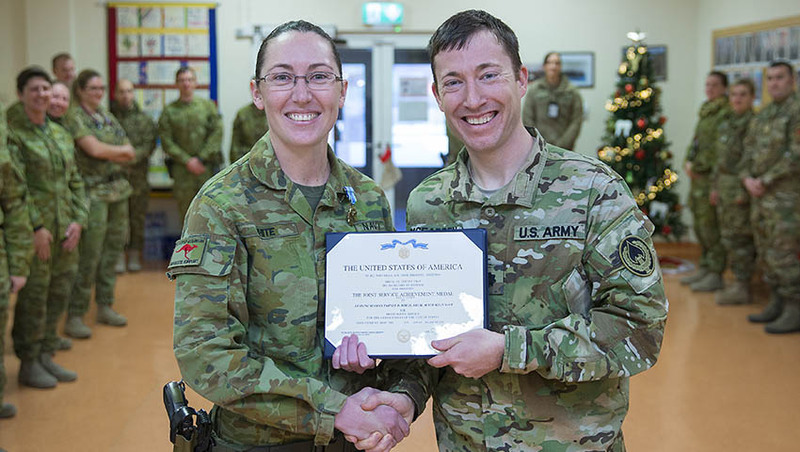 “LS White excelled in her everyday sick-call duties, in addition she prepared incoming personnel to provide self-aid and buddy-aid if wounded and she was a tremendous asset to the team,” Command Surgeon, US Army, Lieutenant Colonel Devin McFadden said. Despite being deployed far beyond her usual calls of duty, LS White said she found the high-tempo environment "equally challenging and rewarding". “I found it extremely fulfilling to know that these people are now so much better off knowing what to do and where to go if a situation should arise." LS White was awarded a Joint Service Achievement Medal, with Combat device, a decoration usually reserved for the US Armed Forces. The medal is awarded by a local commander to junior officers and enlisted personnel for "outstanding achievement or meritorious service performed under combat conditions". “The award was a surprise to me, every time I look at the medal it reminds me of my time in Afghanistan,” LS White said.